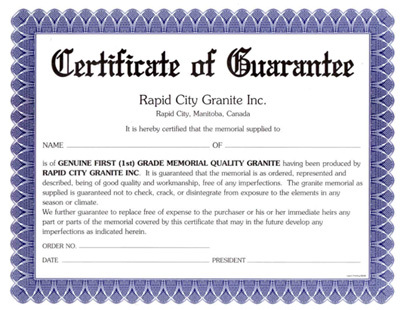 Rapid City memorials guarantees our memorials are of GENUINE FIRST (1ST) GRADE MEMORIAL QUALITY GRANITE having been produced by RAPID CITY GRANITE INC. It is guaranteed that the memorial is as ordered, represented, and described, being of good quality and workmanship, free of any imperfections. The granite memorial as supplied is guaranteed not to check, crack, or disintergrate from exposure to the elements in any season or climate. We further guarantee to replace free of expense to the purchaser or his or her immediate heirs any part or parts of the memorial covered by this certificate that may in the future develop any imperfections as indicated herein.